Noel McNamara’s men have the title in the bag and can complete the Grand Slam in Wales next week. Clarkson and French celebrate a score. IT WAS FAST, it was frantic and downright fantastic entertainment as the scoreboard tipped this way and that with brilliant attacking play in spades. So it was fitting that there was a trophy on offer at the finish in Cork tonight. A brace of tries from Corkman Josh Wycherley, helped Ireland to a thrilling win over France. 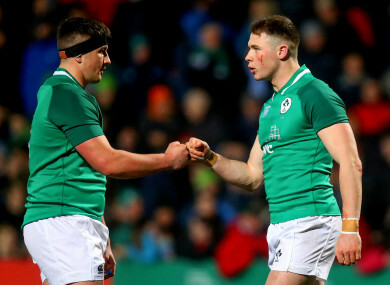 The result, coupled with Wales’ loss away to Scotland tonight, means Ireland are the U20 Six Nations Champions for the first time since 2010. Beginning the night four points behind Ireland in second place, the world champions were always going to be formidable foe for Ireland to take down on a dry night on this fast 4G track. But the task was made even trickier with the loss to injury of captain David Hawkshaw and out-half Harry Byrne during the week. However, the replacement 10-12 axis of Ben Healy and Sean French were at the heart of Ireland’s success here as they ensured the hosts, just as they did on opening night against England, maintained a viciously high tempo and intensity in every act from Craig Casey’s electric bursts for a gap, to John Hodnett’s hard yards. Ireland brought the crowd to their feet with a thrilling breakthrough try on 12 minutes after the 10-12 axis first combined to great effect. Healy slipped French through the gap and the centre returned the favour with a flick back inside to the playmaker on his shoulder. French deftly stepped a tackle and was not felled until five metres out. From that base, Ireland recycled well and Corkman Josh Wycherley bullied his way over the try-line. France hit back almost immediately. Jordan Joseph broke into the Ireland 22, and though French got a solid ankle-tap to bring the Racing star down, the number 8 reacted with a brilliant offload to Jean Baptiste Gros. The errors which cut short the visitors early forays into scoring territory ominously began to fall away and they mounted concerted pressure on McNamara’s men. With each passing attack set they grew in confidence and stature as they hit a rhythm and they hit the front in the 26th minute, Louis Carbonel playing a tidy one-two cut-out with fullback Alexandre de Nardi and the number 10 ran in behind the posts to give himself an easier conversion. The same pair very nearly added seven more to the arrears for Ireland before half-time, after Healy notched his second penalty, but it remained 13-14 through the interval because De Nardi fluffed the finish after a sublime grubber from Carbonel. Ireland flew out of the traps in the second half and mounted an onslaught of forward pressure. Three times arms went up in hope off convincing the officials a try had been scored, but a fierce French resistance on the try-line kept them agonisingly short. The visitors were content enough to get back to halfway with just Healy’s third penalty of the night conceded. Though Carbonel immediately cancelled that effort out, the boundless energy of Casey ensured momentum was kept in Ireland’s favour through the hour mark. His electric break over halfway left props flat-footed and tacklers unable to hold him as he bounced back up for a second run. Liam Turner hit a fine angle to race at the posts. Though he was grounded, there was another penalty in store for Healy. 19-17 to the good, Ireland forced a lead that would have looked decisive against a side other than the reigning world champions. This time the forward-driven onslaught yielded a reward as Wycherley bullied his way over for his second try. The tide threatened to turn yet again when Carbonel showed his searing pace to inflict the most severe punishment for an Ireland turnover in attack. But McNamara’s men stayed the course and while Wycherley was withdrawn, replacement loosehead Callum Reid pushed over the whitewash to give Ireland a third try. Les Bleus showed their attacking teeth again before the night was out, but it was too late to do anything about Ireland’s lead on the Musgrave Park scoreboard or the Championship table. IRELAND U-20: Jake Flannery (Rob Russell ’65), Angus Kernohan (Jake Flannery ’73), Liam Turner , Sean French, Jonathan Wren Ben Healy, Craig Casey (Cormac Foley ’68):Josh Wycherley (Callum Reid ’65), Dylan Tierney-Martin (John McKee ’65), Thomas Clarkson, Charlie Ryan, Niall Murray (Ryan Baird ’53), Martin Moloney, Scott Penny, John Hodnett. FRANCE U-20: Alexandre de Nardi; Vincent Pinto, Arthur Vincent, Julien Delbouis (Mathieu Smaili ’65), Matthis Lebel; Louis Carbonel, Quentin Delord (Kevin Viallard ’75); Jean-Baptiste Gros (Eli Eglaine ’55), Rayne Barka (Loris Zarantonello ’66), Alex Burin (Giorgi Beria ’55), Gauthier Maravat, Florent Vanverberghe (Adrien Warion ’65), Paul Boudehent (Maxence Lemardelet ’46), Sacha Zegueur, Jordan Joseph. Email “Ireland crowned U20 Six Nations champions after thrilling shoot-out win over France”. Feedback on “Ireland crowned U20 Six Nations champions after thrilling shoot-out win over France”.